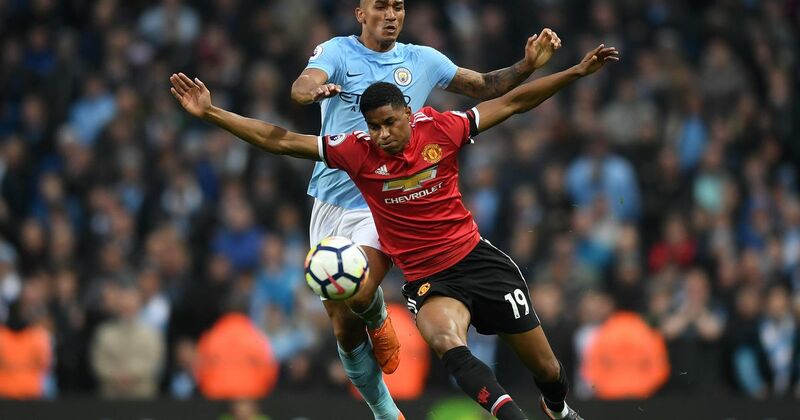 Manchester United's recent upturn of good form will face undoubtedly its toughest test of the entire season as they visit the Etihad on Sunday afternoon. Despite City's dominance in the Premier League over the last 12 months or so, Mourinho's United managed to postpone City's title win in this fixture last season after a phenomenal 3-2 victory. City, Chelsea and Liverpool remain the only three undefeated teams in the league and occupy the top three spots respectably, defeat for City on Sunday would almost certainly see them be leapfrogged by one of the other two sides. Manchester City vs Manchester United will be shown live on Sky Sports Main Event and Sky Sports Premier League. Manchester City's German midfielder Leroy Sane (Image: Getty) Ahead of their match against Shakhtar Donetsk Manchester City had near a full strength squad, although the absence of Belgian midfielder Kevin De Bruyne will be a difficult one for Pep as he is undoubtedly one of his best players and someone who can change a game in an instant. Marouane Fellaini and Antonia Valencia were both available for United in midweek for the Juventus game in Turin after shaking off recent knocks but Romelu Lukaku's availability for the weekend remains unknown.